Exercise and diet are an integral part of a weight loss plan but they are not enough for a successful weight loss. Changing your lifestyle also plays a very important role in reducing weight and cutting that flab. 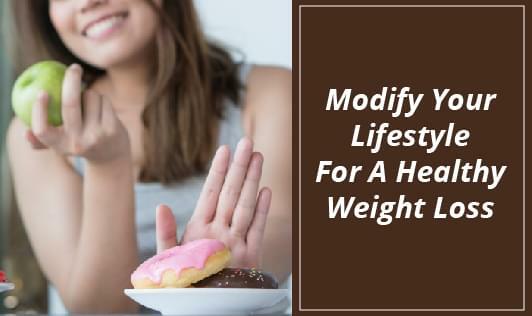 These lifestyle modifications, along with diet and regular exercise, can also help you to prevent obesity if you are overweight or otherwise at risk. 1. Avoid stress, depression, boredom, and frustration. These are triggers to unhealthy eating. Keeping yourself occupied with enjoyable activities such as sports, physical activity or exercise can help you achieve a healthy lifestyle. If you eat excessively due to stress, you can enroll in some relaxation program. 2. Sleep for 7-8 hours. Those who sleep for less than 7 hours a day are less likely to lose weight than those who sleep for 7-8 hours. The quality of sleep is as important as the quantity of sleep. A good sleep-wake cycle is essential for weight loss. 3. Do not rush. Take some time to think and then pick what’s healthy and good for you. When you make a choice in a rush, you are most likely to opt for an unhealthy option. Be mindful in your choices. Even a second can bring an enormous difference in the way you perceive and eat your food. 4. Be consistent with what you do. Consistency is the key to weight loss. To get good results, following the diet and exercise regime regularly is very important. Develop healthy eating habits and do light to moderate exercise regularly. 5. Move more. Sitting for long hours is considered as one of the main causes of obesity and other lifestyle disorders. An hour of exercise is good but it is not enough for weight loss. You need to stay active throughout the day. 6. Keep yourself hydrated. Drink plenty of water throughout the day. Replace the sugary beverages with water. Water not only keeps the body hydrated but also flushes out the toxins and cleanses the system. Drinking water boosts metabolism and also helps you feel full and avoid overeating when you’re trying to lose weight. 7. Snack healthy: Binging at work is the most common reason behind weight gain for most people. Keep your workstation clear of all the high calorie and fatty foods, instead opt for healthy snack options such as nuts or a whole fruit or salad. 8. Focus on food while eating. Do not eat while watching television, reading, cooking, talking on the phone, standing at the refrigerator or working on the computer. Just focus on your food and enjoy your food. 9. Avoid alcohol. Alcohol is very high in calorie content and also lacks essential nutrients. Consuming alcohol provides additional calories to the body and thus, increases fat storage. 10. Quit smoking. Quitting smoking can help you reduce your belly fat and lowers your risk of diabetes and heart problems. This also helps in balancing hormones, especially in women. 11. Review medications. Few medications can also lead to weight gain. If you are taking any medications, consult with your doctor about the effect of those medications on weight.